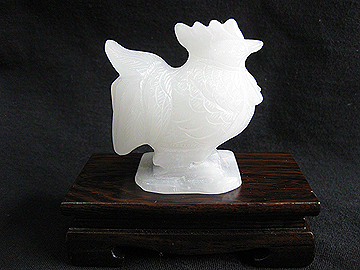 This is a figurine of rooster specially carved from natural white jade. 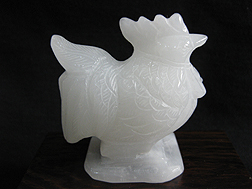 The white jade represents the intrinsic metal element of the Rooster in the west. It is especially recommended to activate the Tao Hua Love Luck for those born under zodiacs rat, dragon and monkey according to the lunar calendar. It has a solid crown on its head with a well shaped beak. Its gesture is firm and confident that makes it also a good enhancer to counter office politics and biz competitor. It could also be used to boost your fame luck and authority. Beautiful details of the carving is visible!